ABDULLAH II, King of Jordan, welcomed world leaders of many religions who had stood with Muslims worldwide in rejecting provocations meant to divide those of different faiths. He condemned all acts vilifying the Prophet Muhammad or falsely using his name — or that of Islam — to justify violence. “There are no sidelines on this issue,” he stressed. Every faith everywhere must be proactive in promoting understanding, he said, adding that the first four words of the United Nations Charter — “To unite our strength” — were not just an old dream, but “a modern urgency”. The United Nations was needed as never before. He said important tasks ahead in the Middle East involved providing better opportunities, especially for young people, averting regional instability and fulfilling the basic human right to live in freedom, dignity, justice and peace. Jordan, for its part, was guided by mutual respect and moderation in its “Arab Spring” journey to accelerate home-grown reforms and achieve national goals. Since 2011, constitutional amendments and new laws had created a matrix of institutions and principles that supported democratization, he said, adding that Jordan would have a new Parliament next year. Turning to the tragic situation in Syria, he said the violence must end immediately and a transition must begin now. There was no alternative to a political solution that would end the bloodshed, restore security and preserve both Syria’s territorial integrity and the dignity of its people. 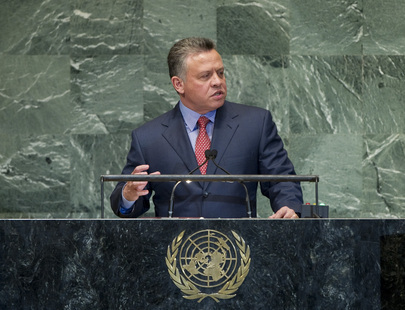 Jordan would support the new Special Representative of the Arab League and the United Nations. More than 200,000 Syrians had sought refuge in Jordan since the beginning of the crisis, and while that had put pressure on its economy, the country would continue to shoulder that responsibility, he said, adding that international support was essential.